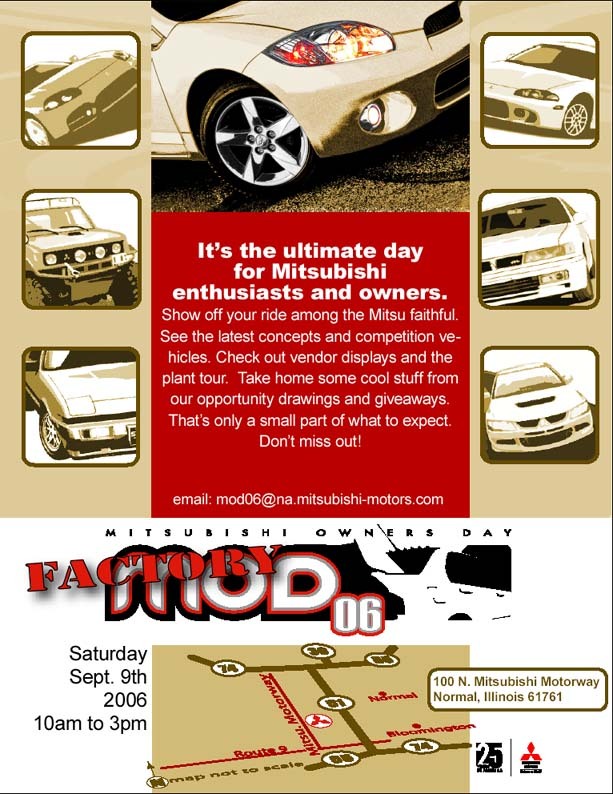 Three weekends ago, we hopped in the car and headed down to Normal, IL for the 2006 Mitsubishi Owners Day at the Normal Mitsubishi plant (the Normal plant is where all DSMs were built, including both Erica's Plymouth Laser and my Eclipse). It was hot, and I managed to get a bit of a sunburn, but it was a pretty good time. Each parking lot was broken up into vehicle generations; Evos, 2gs, 1gs, 3/S', and "others"; it was basically a big car show for Mitsubishi cars. The plant had a few concept cars out for people to take a look at, a ton of free swag and food, and were running plant tours every fifteen minutes. Definitely worth going to see, if only to see how a car is assembled. Then, the following weekend, drove out to Mid-Ohio Sports Car Course in Lexington, Ohio, to watch the first annual NASA Championships. We left the house at around 7:00 PM on Friday after work, arrived in Lexington at around 3:30 AM local time, then got up first thing the next morning to watch everyone make their qualifying runs and participate in the autocross that the Mid-Ohio School held for all attendees. Sunday was race day, and around noon or so we packed up to head home. "Rushed" is about the only word you could use to describe the weekend, but we had a blast; the event site was fantastic, there were a ton of people (and racers), and it was generally just a great time. Both Erica and I played tourist both days, snapping off a bunch of pictures both days. Finally, yesterday's fun was getting six of us together and heading over to CIR for their monthly 200 lap team race. Basically, you get six people together to collectively pilot a go-kart 200 laps (about 30-32 seconds per lap, if you're any good), making five driver changes and one refueling pit stop. We'd never done it before, so coming in 13th in a pack of 20 teams didn't seem too bad at all. My arms and shoulders are killing me today, though; you wouldn't think it, but 30+ laps in a little go-kart is incredibly hard on the upper body (at least, it is in those karts; you have to wear a helmet, neck brace, and full fire suit to be allowed on-track at CIR). Adam set our best time of the day, at 30.99 seconds, followed by Kris who came in at 31.23 seconds.